The story of Maria Altmann, a woman who fled Nazi-occupied Vienna only to come back to Austria decades later to legally reclaim a priceless family painting, is one that simply cries out “make me into an Oscar-worthy film”. Sure enough, with a few documentary films already covering her story, Hollywood mega-producer Harvey Weinstein has heard the call and crafted the project now known as Woman in Gold – and boy, is it clear it wants another thing that’s gold. A European WW2 setting, an octogenarian protagonist played by an esteemed actress, a legal case, being based on true events; the ingredients are all there for a cynical Oscar-bait flick for those old white men at the Academy to lap up, but what it truly lacks is the genuineness. Not for one second do you buy that these filmmakers are at all interested in trying to tell this inspiring true story in a fictional capacity, but that instead they are trying to milk all the awards potential they can in order to win over year-end pundits. That, more than anything, ironically leads to its own downfall; it is so fixated on trying to be as attractive to awards voters as is humanly possible that it mostly forgets to be a captivating film of its own right. 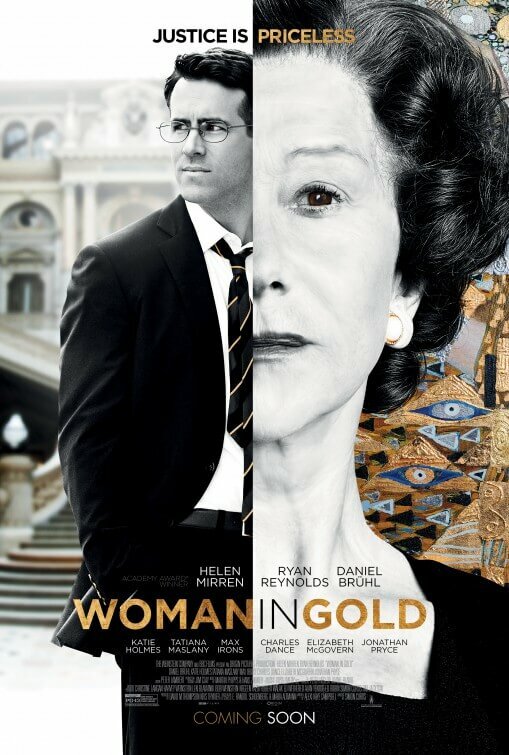 We cannot develop an interest in the legal case that takes up a good portion of the movie, set in the late 90s as Altmann (portrayed here by Helen Mirren) and inexperienced lawyer Randol Schoenberg (Ryan Reynolds) sue the Austrian government to reclaim a family painting by Gustav Klimt, because neither does the film. Any scenes involving the legal side of things, which as it turns out is most of them, is so unapologetically heavy on exposition that there’s not enough room to develop an emotional connection to it; they spend so much time talking about the facts of the case instead of focusing more on the people making the case in the first place. There are no real layers to peel back with either Mirren’s or Reynolds’ characters, it really is a case of “she’s the uptight and no-nonsense elder with a dark past, and he’s the inexperienced but happy-go-lucky sidekick along for the ride”, and that’s all the movie feels it needs to give us. It’s like a duller version of Philomena, except Mirren and Reynolds gel together as well as Judi Dench and Steve Coogan did. More successful, however, are the multiple flashback sequences to Altmann’s past where she, then played by Tatiana Maslany, and her family were tormented by Nazi officers in Vienna. This is where the film becomes infinitely more gripping and engaging, even emotional, as we see the growing influence of anti-Semitic activity on the streets – Jewish citizens are forced to scrub the floors with acid and stand helpless as officers cut the payots off the side of their heads – while Altmann and opera singer husband Fritz (Max Irons) make a daring escape one fateful afternoon. This is where the film truly understands the horror of Altmann’s situation as well as establishes a true emotional connection for the family she is forced to leave behind, something that the rest of the film sorely lacks. Though Mirren and Reynolds do fine on their own, even if they don’t work as well together as they should, it’s sadly at the expense of a fantastic cast who are shamefully wasted in far lesser supporting roles. Daniel Brühl is not given much to do except provide even more exposition, while esteemed character actors like Jonathan Pryce, Elizabeth McGovern and Charles Dance only appear in a handful of scenes between them. Getting the worst treatment, however, is Katie Holmes who basically reprises her role from Adam Sandler’s Jack and Jill as “supportive wife with little to no defining character of her own” for Reynolds to act off of. Her character is horrendously side-lined; there’s a scene later in the film where her water breaks (she is pregnant with her second child) yet she acts as if she just stepped in a small puddle and even insists Schoenberg go to the court case instead of being by her side – that’s how much disdain the film seems to have for her, and we have no idea why that is but she deserves better material than this. But instead, Woman in Gold just wants to keep reaching for that Oscar gold – and in doing so, it betrays what made the story interesting in the first place. Woman in Gold is a disappointingly dull and cynical biopic that seems more concerned with targeting awards pundits than expressing any real interest in the story and real-life people it is representing.